@rachelandrew And there was great rejoicing. @rachelandrew What’s it like being in the middle of a launch of a big new CSS feature? @rachelandrew It involved a lot of email. @rachelandrew Grid is: • Exciting - a real game changer • Confusing - it doesn’t seem to do what I thought it would • Scary - there are so many new properties to learn! @rachelandrew I can’t tell you what to do. @rachelandrew I can help you develop the skills to make those decisions yourself. @rachelandrew I want you to be the amazing CSS layout person on your team. @rachelandrew You need to understand CSS. @rachelandrew Core ideas that help CSS layout make sense. @rachelandrew Inheritance - which properties will inherit values from their parent. @rachelandrew Specificity - which rule wins when two things could apply to the same element. @rachelandrew Percentages • Ugly • Easy to understand • If they total more than 100% bad things happen. • Can be converted from an ideal pixel size using a straightforward calculation. @rachelandrew Past layout methods create the appearance of a grid, by lining things up. @rachelandrew https://codepen.io/rachelandrew/pen/KXGbQo/ flex: 1 1 auto; Items can grow and shrink so stretch to fill the container. With no extra space, items shrink as before. @rachelandrew https://codepen.io/rachelandrew/pen/KXGbQo/ flex: 1 1 0; Items can grow and shrink so stretch to fill the container. With a flex-basis of 0 space is distributed from 0, making equal columns. @rachelandrew Flexbox is starting from max-content and taking space away. Grid starting at min-content and adding space. @rachelandrew This is not exciting. But it will let you do exciting things. @rachelandrew It is all just lines. @rachelandrew https://codepen.io/rachelandrew/pen/QqJbyB/ grid-area: content / content / content ; grid-row-start grid-column-start grid-row-end • grid-column-end is set to the value used for grid-column-start, which is ‘content’. @rachelandrew https://codepen.io/rachelandrew/pen/QqJbyB/ grid-area: content / content ; grid-row-start grid-column-start • grid-row-end is set to the value used for grid-column-start, which is ‘content’. • grid-column-end is set to the value used for grid-column-start, which is ‘content’. @rachelandrew You have real choice for the first time. @rachelandrew What would be the best method to achieve this design pattern? @rachelandrew Could we solve this problem with a new design pattern? @rachelandrew How old is the oldest CSS in your project? @rachelandrew 368 people working on existing projects 29 had CSS in their codebase written 10 years or more ago. @rachelandrew Old CSS in your project doesn’t mean you can’t use new CSS. @rachelandrew This is where understanding CSS comes in really useful. @rachelandrew Creating systems with new layout. @rachelandrew Other layout methods still exist. @rachelandrew https://codepen.io/rachelandrew/pen/ZXNYob/ Floating the image means the text wraps round. Defining a grid on the container means we don’t get the wrapping behaviour. @rachelandrew https://codepen.io/rachelandrew/pen/RLmNvY/ Multi-column layout splits content into equal width columns. Using column-width of 200px means we get more columns if there is room, fewer with less available width. @rachelandrew https://codepen.io/rachelandrew/pen/OxYVmL Flex items with the value of justify-content set to space-between. I also use flexbox to centre the word in the circle. @rachelandrew You don’t need a grid-shaped hammer for every layout task. @rachelandrew Off-the-shelf frameworks are designed to solve generic problems. @rachelandrew Do you want your project to inherit the CSS issues of the rest of the world? @rachelandrew Working with less capable browsers. These may not always be old browsers. @rachelandrew A lack of understanding on one side. A lack of confidence on the other. @rachelandrew Old browser versions of survey respondents cited IE11 as oldest IE supported. @rachelandrew https://rachelandrew.co.uk/archives/2016/11/26/should-i-try-to-use-the-ie-implementation-of-css-grid-layout/ IE10 & 11 have the -ms prefixed older version of grid layout. @rachelandrew For other desktop browsers supporting the last 2 versions is common. @rachelandrew Many browsers without support for Grid and other new CSS at this point are mobile browsers. @rachelandrew Many of the browsers without support are most popular in areas where data is expensive or devices less powerful. @rachelandrew Stop looking for polyfills and shims. They will make the experience worse for less capable browsers and devices. @rachelandrew Using Grid rather than loading a big framework can help create a better experience even for browsers that don’t support Grid. @rachelandrew Feature Queries - use CSS to ask if the browser supports a feature before using it. @rachelandrew Create complex layouts for browsers that support them with a few lines of CSS. @rachelandrew Making the web available to everyone. That’s exciting. View Graduating to Grid on Notist. When CSS Grid Layout shipped into multiple browsers in the Spring of 2017 it heralded the dawn of a new way to do layout on the web. Now that the excitement of launch has passed, Rachel Andrew will take a look at what went right or wrong in these first few months, and offer help to those struggling to transition away from legacy methods. 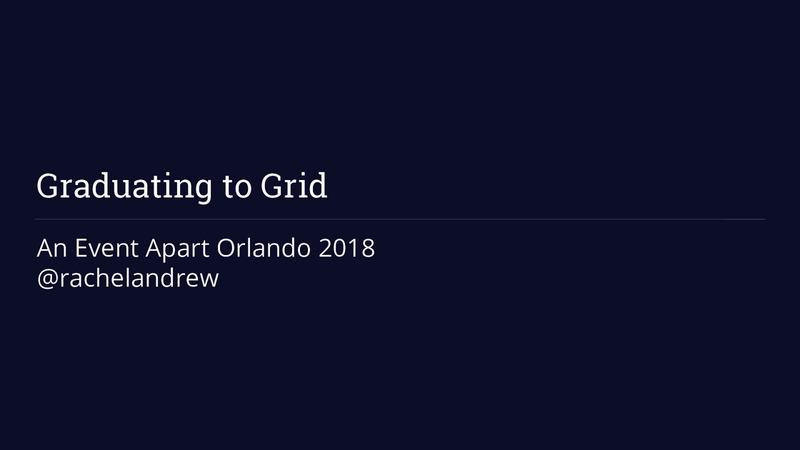 In a practical, example-packed hour, Rachel will help give you the confidence and practical skills to fully embrace Grid layout. We’ll compare common framework patterns to new Grid code, and learn how to create a workflow that is right up to date—a workflow grounded in new CSS, yet able to care for old browsers and ensure a good experience for their users. Should I try to use the IE implementation of Grid Layout?